Before 1993 and the founding of the Ultimate Fighting Championship, the world lacked a flagship No Holds Barred organization. Brazil had vale tudo events, Japan's Pancrase organization was only a few years off, and Frank Dux had wandered into the jungle with a trophy shaped duffel bag, only to return from his fictional Kumite with an eerily familiar trophy. But in 1987 a young karateka named Ryu was setting out on only a slightly more fictitious quest than Dux, in the World Warrior tournament. The dizzying heights that combat reached through the Street Fighter franchise have yet to be matched in the real world. But as so many members of the UFC's key demographic spent their early years at the arcade machines, the anticipation is tangible every time fighters step into the cage. Is someone going to do some stuff right out of a video game this time? The parallels drawn between Lyoto Machida and Ryu, or Jon Jones and Dhalsim by fans should emphasize this. Anthony Pettis is marketed as someone who could have been pulled right out of a fighting game. And I think we all know that if the all female fight organization, Invicta FC could find a good looking lady who could fight like Chun Li and win matches, women's MMA would be a lot more successful. Yet through the years of evolution in mixed martial arts, and combat sports around the globe, we have had occasional moments which have come close to measuring up to the world's favorite fighting game franchise. Just last week we saw Shane Campbell in World Series of Fighting execute a beautiful body kick and attempt a hadouken afterwards. Though it was disappointing to see Campbell abandon the strategy after his first attempt, he would do well to remember that it's only spamming if you lose—if you win it's called “zoning”. And the power of the low jab has been no secret to Street Fighter players for years. But we're only starting to see the game-breaking power of this technique in the octagon. Read on and we'll talk about some of combat sports' most Street Fighter-esque moments. Dual protagonists, Ryu and Ken shared the same teacher and this made for a good narrative through the SF games (and a nice excuse to clone one set of moves with very slight differences). As the series progressed the two were awarded more unique moves to differentiate them and each has gone through his fair share of techniques. 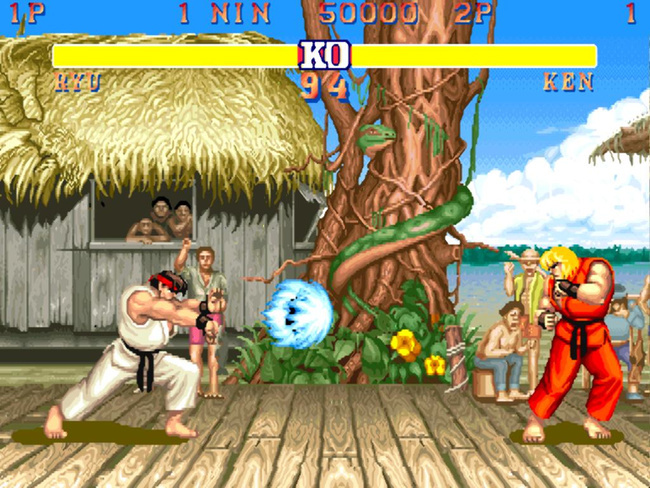 A kick which Ryu had picked up in time for Third Strike was his side kick, dubbed Sokuto-geri. This side kick with a full step up was the kind we all recognized from the movies and could launch Ryu's opponents a good distance across the screen. Sokuto is actually the blade on the foot in karate, but most real world side kicks are done with the heel. 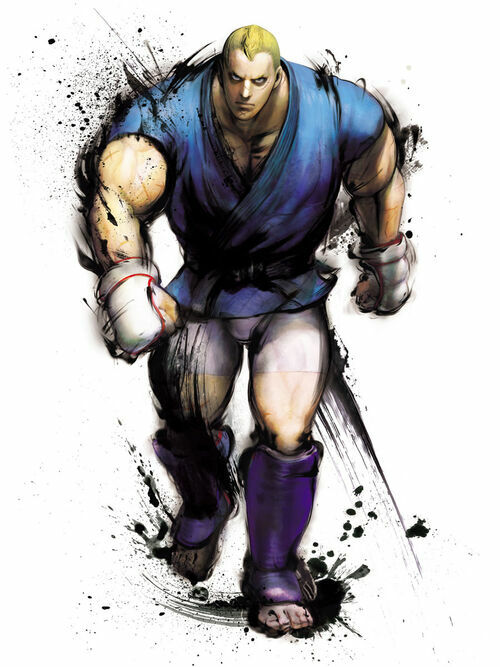 Unfortunately the technique didn't make it into other iterations of the game despite being a fan favorite—Ryu forgot it... or something, but it did sneak into Jon Jones' bout with Vitor Belfort. Jones had been slamming side kicks in straight from his stance, but finally decided he had the space and the time to perform a full step up into a gut-munching power kick. Belfort staggered backwards, hit the fence, and flopped to his back, winded. Another trademark of Ryu's is the Satoksu Wari or 'clavicle breaker'. Seemingly a clumsy overhand animation, it soon became a recognized Ryu unique technique. The idea of breaking the collarbone might seem daft to some, and a traditional kickboxing guard actually does a good deal to mitigate the threat of this ever working. But the downward overhand, sometimes called a Dragon Punch by especially romantic practitioners, has been a staple of Kyokushin karate tournaments for years. Kyokushin contests are fought bareknuckle and forbid punches to the head (but permit kicks there). It makes for some weird looking fighting. Here is Kyokushin competitor, Roman Nesterenko demonstrating his own 'clavicle breaker' which sets up a two-level knee strike, one of his competition favorites. The punch serves to draw the elbow up, for the knee to the body, but also to pin the hand inwards for the knee to the head. Lovely stuff. It's worth noting that while broken hands and broken ribs are nasty for professional fighters, broken clavicles can be career ending, as Igor Zinoviev found out against Frank Shamrock. Ken Masters, the less likeable but more commonly played of the two Shoto protagonists, shares much of Ryu's move set, but carries his own unique techniques too. The Zenpou Tenshin or combat roll which can be used to blink past opponents in SF III Alpha might seem a little out there, but it recently found use inside the Octagon against the terrific striker, Thiago Alves. Jordan Mein, who had been boxing the ears off of Alves, found himself backed into the fence for the first time in the bout. He faked to move one way, then the other, then performed a whimsical somersault to escape. It got a terrific rise out of the crowd, but Mein ran straight across the octagon to the other fence, and soon ate a hard body kick that put him down and out. Frankly it was deserved because no one should want to be Ken. Weird strikes and silly rolls are all very well and good, but the most spectacular techniques in any fighting game series are often the grapples. There's a reason that Hugo and Zangief remain firm fan favorites. So who is pulling off the ludicrous throws in combat sports? Let's start with Oro, the one armed hermit. Oro, appearing in SF III, fights under a spell which keeps one of his arms out of action (and under his robes) at all times. This is self-imposed due to Oro liking a challenge and not wanting to accidentally kill opponents. Another interesting piece of lore developed to fit the shortcomings of a two dimensional fighting game as every time Oro changes sides on the screen, his other hand is under his robe because his sprite is simply mirrored. Oro's signature throw is to simply grab a hold of his opponent with his one arm and to throw them back and forth. Seems pretty much impossible right? How can I possibly show you a one armed throw? Well, he might not have heaved his opponent back and forth over his head with one arm, but Toshihiko Koga, one of Japan's greatest Judoka, used to keep a one armed throw in his back pocket just in case. Koga was already considered one of the finest technicians with the Seoi-Nage shoulder throw, but in the 1988 world championships he was able to execute one with just a single hand on his opponent. The grand-daddy of all fighting game throws though is the Izuna Drop. The Izuna Drop is a legendary (read: fictitious but way more fun this way) ninjutsu technique where both fighters are in the air, plummeting head first towards the ground, and one takes the brunt of the fall while the other escapes unharmed. Most famously it is used by Vega in the SF series. I don't know about old school ninjutsu secrets, but the UFC's very own Rustam Khabilov is the man to look to if you want to see guys dropped on their heads. But if you really want to see a leaping suplex, where the fighter is brought down directly on his head with his full opponent's weight on top of him (and you probably do, you sick so-and-so), then the fight to watch is Kevin Randleman versus Fedor Emelianenko. The world of street fighter is fabulously over the top and hilarious. But in an age of superb athletes who were brought up on fighting games and kung fu flicks, and who are willing to try anything, we've got plenty more still to see. Anthony Pettis and Jon Jones are leading the charge in trying new, bizarre techniques that they saw in films or games, and in a sport with real money available for those who can sell themselves, younger fighters will try the same. And it's a two way street. In a curious case of art imitating life, the Street Fighter franchise even gave the aforementioned Fedor Emelianenko the SF treatment. Just as Sagat, who introduced a generation of young boys to Muay Thai, was based on Sagat Petchyindee, SF IV's Abel is a Frenchman, but shows undeniable similarities to the infamous Russian Sambo master. While news reports complain of shooting games getting more and more realistic, fighting games—and fighting itself—can only get more outlandish. And that's good! Technical perfection is impressive, but no-one wants to see an automaton go after it and pump 1-2 punches for three rounds. It's the moments of creative license and borderline insanity which make the world so much more interesting—and in fighting more than any other sport, they often pay off. Keep your eyes on Fightland and one day we might even challenge ourselves to take a look at Blanka.